After reading Erin Byers Murray's account of daily life working on an oyster farm, I have been intrigued to see what it all might actually look like. Today couldn't have been a more perfect day to have a meet and greet with those delicious little bivalves out in Dennis. 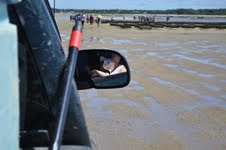 The tour began with an open air jungle safari....minus the animals.......and the jungle.....Ok, well we were in the bed of farmer Aaron's pickup, winding through the dunes and sand down to the beach. But it felt like a safari. 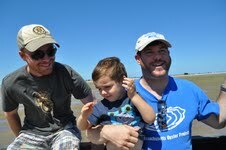 And we were on the hunt for oysters! As a regular beach-goer/lover, I had never seen a beach quite like where we were today. It seemed like instead of a towel and rolling cooler, beach bums cruised in-literally-to the beach with their Jeep Wranglers, Chevy pick-ups or even their Honda sedans! Cars at the beach....that was a first for me! As we came down the dune path onto the flat stretch of low tide beach, we saw hundreds of the oyster houses (I think the actual term is a rack, but it is more fun to call them oyster houses) and our small party of 30 gathered around. Farmers Aaron and Eric happily answered our questions about the farm and about oysters while MOP volunteer (and oyster aficionado) Josh Hoch shucked oysters straight from the racks for tour goers to slurp down. 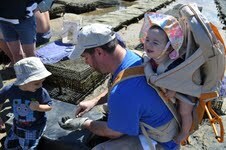 I witnessed a few kids try their first raw oyster ever. Gotta give them props! And when I had snapped a few dozen photos (a little hobby of mine), I had my chance to try an oyster. I have to say that I have had a good share of oysters-whether it has been at home or out at a restaurant-raw, grilled, in a shooter, topped with a myriad of tasty things-and they all have been quite delicious. But to be able to enjoy one straight from the farm, on a perfect August day, practically right out of the hands of the farmers who have worked tirelessly to raise them from seed-brings with it a whole new level of appreciation. -for only $25 a year, anyone who lives in Dennis can farm their own oysters!!!! 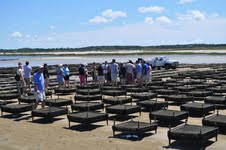 Well, if you are lucky enough to get through the wait list, and if after the many years of waiting, you happen to have say, $250,000 worth of equipment at your disposal-then yes, you too can be an oyster farmer. Personally, I would rather leave it to farmers Aaron and Eric, especially because I have a notoriously black thumb. -the farmers and their workers often get out to the farm at the wee hours of the morning to harvest oysters, deliver them to restaurants in Boston (like Legal Seafoods!) and be done in time to go to another job! That is a lot of dedication and love right there! 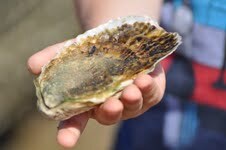 -It takes 3 years for an oyster to grow from seed to appropriate harvest size. We had the chance to see some small oysters that had rapidly increased in size from seed in February to about the size of a quarter! Those oysters must be eating their spinach! -The farmers take all the oysters out of the water and store them inside during Winter because the beach freezes over and the oysters would die. Farmer Aaron said this process is his least favorite week of the year. I should say! All in all, today was an awesome day! Lots of people came out and learned about oyster farming and also a little about the wonderful things that the Mass Oyster Project is doing. My husband and I always have a great time at MOP events and we are looking forward to the next event in Plymouth (beer and oysters? Yes please!!!). I have only one other little tidbit for you oyster fans out there. Don't shuck without protection! Trust me.